Adjuvants have been used for decades to improve the immune response to vaccine antigens. Strong vaccines such as attenuated live vaccines or vector driven vaccines induce an effective humoral and also a cellular immune response to the administered antigens with a long-term protection against the infection. Vaccines based on recombinant peptides, polysaccharides, nucleic acids, or killed vaccines share weak antigens and are generally insufficiently immunogenic. For those vaccines adjuvants or combination of various adjuvants are helpful to potentiate or modulate the immune response (e.g., increase, accelerate, prolong and/or possibly target) or modulate to a different type (e.g., switch a Th1 immune response to a Th2 response, or a humoral response to a cytotoxic T cell response). Adjuvants can be classified according to their source (natural, synthetic or endogenous), mechanism of action, or physical or chemical properties. 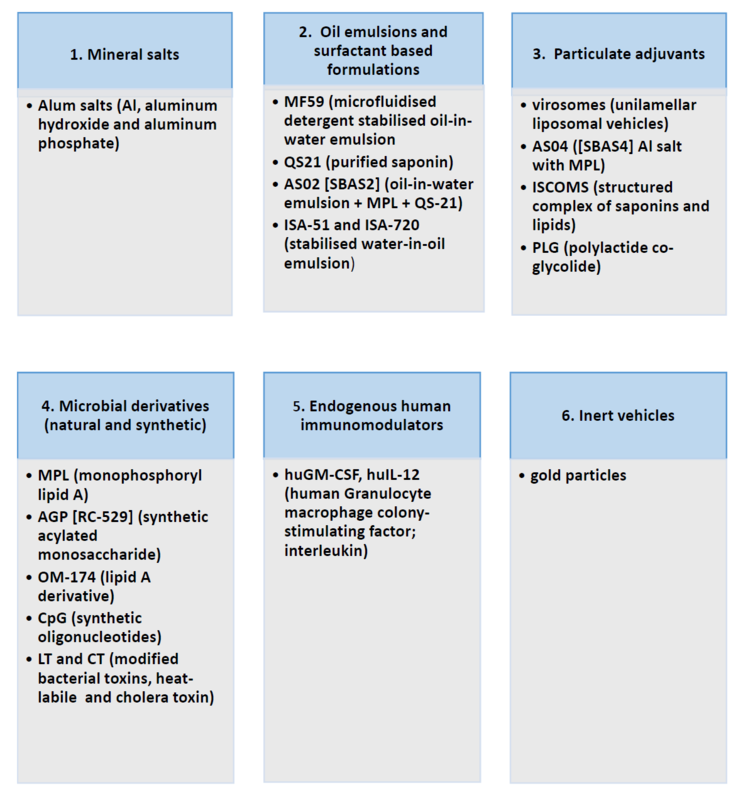 The current most common described adjuvant classes are presented in table 7.1. The oldest and still used adjuvant is alum, already discovered by Alexander Glenny in 1926: toxoid precipitated with aluminum potassium sulfate, induced a stronger antibody production when injected into guinea pigs than soluble toxoid alone. 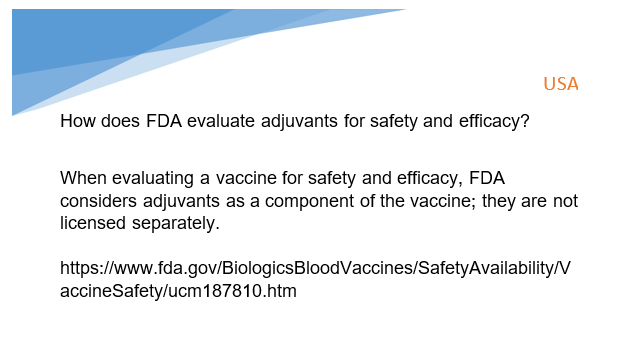 Today, alum is the most common adjuvant used in approved prophylactic vaccines because of its excellent safety profile and ability to enhance protective humoral immune responses. 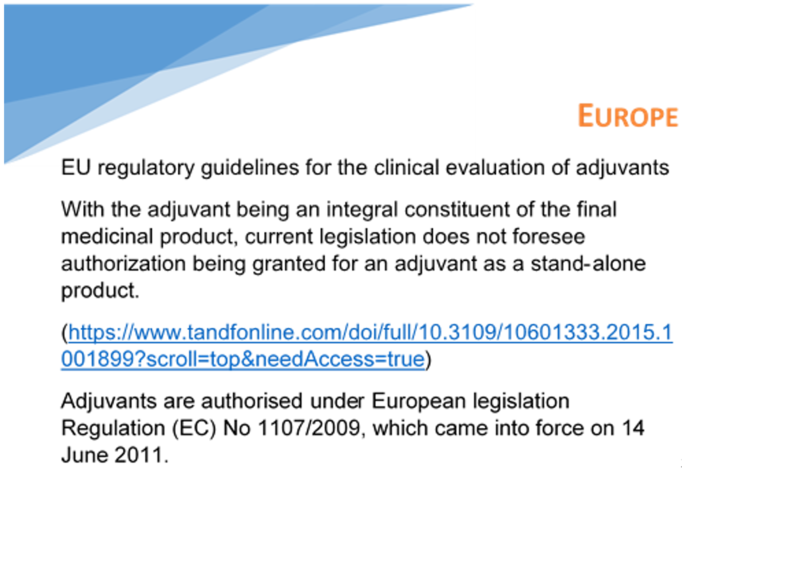 Registered adjuvants in Europe: since the 1990ies MF59 (an oil-in-water emulsion, squalene) for influenza vaccines, MPL (monophospholipid A, an LPS analog) + alum for Cervarix, and AS03 (oil-in-water emulsion, squalene) for influenza vaccines. In veterinary medicine aluminum adjuvants have been used in a large number of vaccine formulations against viral and bacterial diseases. Numerous inaccuracies are found in literature when referred to the term ‘alum’. The most used term ‘alum’ only applies to aluminum potassium sulfate. Since problems have occurred during manufacturing, alum is not used anymore in vaccines. Instead, several other insoluble aluminum salts are used, such as aluminum hydroxide and aluminum phosphate as they can be prepared in a more standardized manner and capture antigen by direct adsorption. Three potential mechanisms are frequently cited to explain how adjuvants increase humoral immunity, although scarce experimental evidence is publicly available: firstly, the formation of a depot by which the antigen is slowly released to enhance the antibody production. Secondly, the induction of inflammation thus recruiting and activating antigen presenting cells that capture the antigen. Thirdly, the conversion of soluble antigen into a particulate form so that it is phagocytosed by antigen presenting cells such as macrophages, DCs, and B cells. The main theory has been that depot formation and the associated slow release of antigen are responsible for alum enhancement of antigen presentation and subsequent T- and B-cell responses. However, recently several papers show that the depot formation is dispensable for the adjuvanticity of alum. Many bacterial toxins are encoded by chromosome, plasmids or phages and can be broadly divided in two groups referred to as endotoxins and exotoxins. Endotoxins are cell-associated structural components of bacteria cell envelope represented by peptidoglycan constituent muramyl dipeptide (MDP) and muropeptides, or lipopolysaccharide (LPS) or lipooligosaccharide (LOS) which are located in the outer membrane of Gram-negative bacteria. Exotoxins are mostly protein toxins which belong to the most powerful human poisons known. They are actively transported from bacteria or released by cell lysis induced by host defense mechanisms or by the action of antibiotics. Some bacteria produce many toxins like Staphylococci or Streptococci, whereas other bacteria like Corynebacterium diphtheriae produce just one. Some toxins e.g. pore-forming hemolysins or phospholipases exhibit broad cytotoxic activity towards various cell types, while others like clostridial neurotoxins act specifically only on neurons. Some bacterial toxins may serve as invasins; others damage the cellular integrity by means of enzymatic activity or pore-formation causing the cell death. The cytotoxic activity of toxins has been utilized to treat various neurological disorders as well as to generate immunotoxins to kill malignant or virus-infected cells. Moreover, various bacterial toxins have been differentially modified either by single point mutations, insertion of specific sequences or by a deletion of parts of the toxin molecule to alter their binding abilities and/or abolish their enzymatic activity to be used for vaccination, antigen/drug delivery or, most importantly, as adjuvants. Scientific advances in molecular engineering enabled the development of vaccines based on mutated bacterial toxins, however, only few are nowadays used for treatment and/or prevention of human diseases. Detoxified C. diphtheriae diphtheria toxoid or C. tetani tetanus toxoid are used for the universal vaccination against diphtheria or tetanus, respectively. The non-toxic B subunit of V. cholerae cholera toxin (CTB) used as a protective antigen together with killed vibrios in a widely licensed oral cholera vaccine. Similarly, B. pertussis pertussis toxoid (PT9K/129G) has been approved for human use as a component of a vaccine against B. pertussis infection. Although diphtheria toxoid is successfully used as a carrier in glycocconjugate vaccines against variety of bacterial pathogens, four clinical trials failed to prove the benefit of P. aeruginosa exotoxin A in such vaccines. Alum refers to several aluminum salts and is the most used adjuvant. It is safe and elicits predominantly a Th2-type antibody response that results effective in a large variety of vaccines. However, alum hardly promotes Th1-type antibody responses. Apart of that, alum poorly stimulates mucosal immunity. Mucosa tissues are the first line of defense against many pathogens and the ecological niche of commensal and opportunistic microorganisms. Therefore, mucosal immunity is considered the gold therapy to evade pathogen colonization and confer herd immunity against certain particular pathogens. Vaccine adjuvants that target mucosal immunization must promote a large series of biological and complex activities as Th17 cell development, APC proliferation and IgA production. Alternatively, to alum, other adjuvants were licensed: MF59, AS03 and RC-529. RC-529 is used in rec Hepatitis B vaccines (licensed in South Korea). One of the most successful LPS-based adjuvants is the Monophosphoryl Lipid A (MPL). MPL is demonstrated to be less toxic than the parent (0.1% of toxicity) properties of LPS. At present, MPL is adjuvant of approved vaccine preparations for humans in Europe (Cervarix) and pollen allergy (Pollinex Quatro) and Australia (Fendrix). Cervarix, a vaccine to prevent cervical cancer caused by human papillomavirus types 16 and 18, includes AS04 in its formulation. AS04 is a combination of aluminum hydroxide and monophosphoryl lipid A (MPL). MPL is a purified fat-like substance. One vaccine for the prevention of H5N1 influenza, contains the adjuvant AS03 an oil-in-water emulsion. The AS03 adjuvant is made up of the oily compounds, D,L-alpha-tocopherol (vitamin E) and squalene, and an emulsifier, polysorbate 80, which helps ingredients mix together and keep them from separating, and water containing small amounts of salts. The vaccine is not commercially available, but included within the U.S. government’s National Stockpile if public health officials determine it is needed. Poly(I:C) is synthetic double-stranded RNA that mimics a molecular pattern associated with viral infection. In rhesus monkeys, poly(I:C)-containing vaccines against SIV—a close relative of HIV that causes an AIDS-like disease in monkeys—have elicited protective immune responses. CpG DNA adjuvants are short segments of DNA that include sequence motifs, or patterns, commonly found in bacterial DNA. Hepatitis B vaccines containing CpG-based adjuvants are being tested in clinical trials, and initial results suggest that the CpG-adjuvanted vaccines are safe and effective.